Snow days and all, thank you for joining us at the 5th Annual Asheville Marathon and Half. This highly acclaimed race is made special and unique for you and because of you! We hope that everyone had a blast and really took in the scenery of the beautiful Biltmore Estate! Congratulations goes out to all of the runners! Looking for your 2017 Race Results? Find Saturday Half Marathon Runner Results Here! Find Sunday Marathon and Half Marathon Results Here! Many thanks to our incredible race day photographer, Paul Jackson and his team! Photos are now available at the Paul Jackson Photography website. All VISIBLE BIB NUMBERS were tagged. Need help finding your photo? Email Paul at paulkjackson@gmail.com. Join us in 2018 for our boutique style race! Get EARLY BIRD PRICING for a limited time! SIGN UP HERE! Didn’t make it to the race? Unfortunately, we do not offer any deferrals or refunds for this race. There will be no discounts or refunds offered at this point. You can pick up your awards starting Thursday, March 16th at noon until 5pm or Friday from 11-2:30pm. Please come to the iDaph Head Quarters located at 240 Old Airport Road, Fletcher, NC 28732. Not local? That’s ok, we can ship it to you. For more info go HERE. Shipping for awards — they are glass and breakable so we have to pack these with great care for you and ship them fragile. 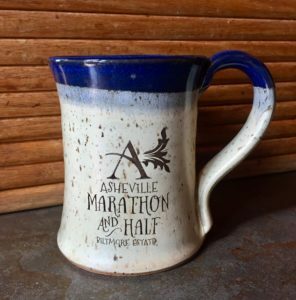 2018 AVL Marathon products to purchase are HERE including the very popular mugs, stemless wine glasses, participant shirts, pint glasses and more! Yes, you can exchange in our office. Anyone looking to pick up clothing that was dropped off at one of the clothing drops, must come to the iDaph Events Head Quarters to pick up their items: 240 Old Airport Road, Fletcher, NC 28732. You can stop by starting Thursday, March 16th at noon until 5pm. Then Friday from 11-2:30pm. We are not shipping any lost and found or clothing drop items. We are donating whatever is not picked up by Friday at 5pm to a local ministry. WE WANT TO HEAR YOUR THOUGHTS! We love to hear your feedback and are always looking on ways to improve these events. Take our survey! Don’t forget to vote for your favorite water station on the course in the survey! We will reward one water station $500 in CASH for the best station on Saturday and the best on Sunday, voted by our participants! What station did you like the best?! A HUGE THANK YOU TO ALL OF OUR 2017 SPONSORS!